Have you ever been stuck in the field trying to troubleshoot a faulty system? When communications are suspect you will want to be armed with information on how to field-test an RS-232 to RS-485 converter. This article gives detailed instructions on how to do just that in a two-wire system. When you have a converter without an Echo On option, you need a second RS-485 port or converter to receive the signal transmitted by the first converter OR to transmit a signal to be received by the first. This is because a 2-wire RS-485 port is half-duplex. It either Transmits or Receives, but not both at the same time. While transmitting, Receive is disabled; while receiving, Transmit is disabled and tri-stated. The Data A(-) line from one converter is connected to Data A(-) on the other converter, and the Data B(+) from the first is connected to Data B(+) on the second. A terminal program is opened to access one port for Transmit, another port for Receive, and data is transmitted from the first port to the second port. Next, data is transmitted from the second to the first. If data is received and transmitted in both directions, the port/ converters are most likely fine. 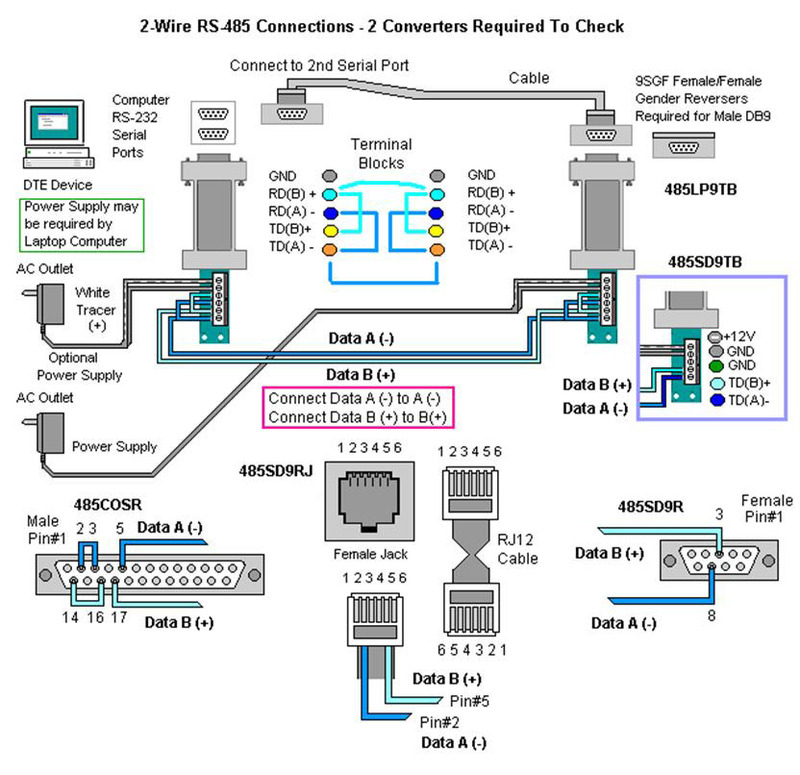 Refer to the figures for RS-485 converters with Echo or RS-485 converters without Echo. 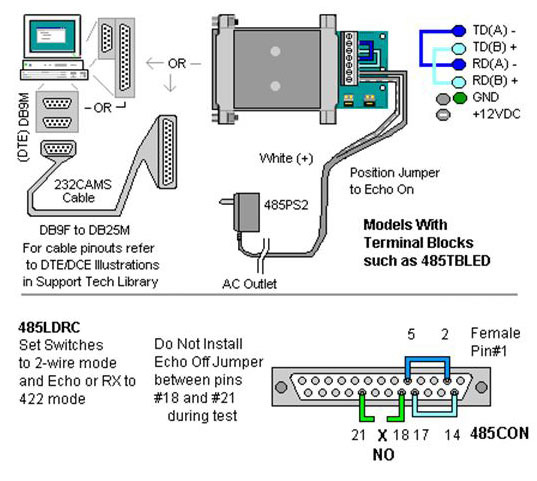 Set the Echo On or Receiver to RS-422 mode (4-wire RS-485 mode). When connectors use DB9, DB25 or RJ11 connectors, it is usually easiest to wire a matching connector or cable according to the pinouts. Refer to figures. Note: DB9 pin numbers are molded into the connector. To locate pin #1 on the male connector, hold the connector horizontally with the row with the most pins on top, the upper leftmost pin is #1. On a female connector, the upper rightmost is #1.